Updated: Fixed typo in list of (Sprint) LTE bands supported. 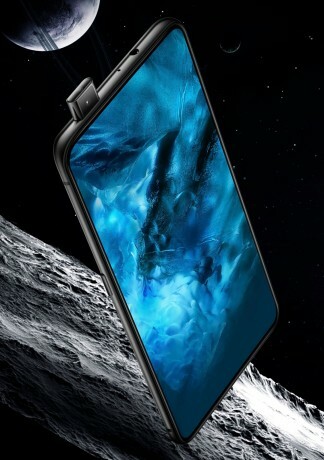 Vivo today announced that its all-screen NEX flagship phone will be launching this month in Russia, India, Malaysia, Hong Kong and Taiwan, making it available in the global unlocked market. The international model supports LTE bands 2/4/5/12/25/26/41, meaning basic support for AT&T and T-Mobile networks, as well as full support for the CDMA and LTE bands used by Sprint. The NEX has a truly all-screen design. To avoid employing a notch, the speaker and fingerprint reader are both built into the screen, and the 8-megapixel selfie camera slides up from the top of the phone when in use. The AMOLED screen measures 6.59 inches and has FHD+ (2316x1080) resolution. The premium model is powered by a top-end Qualcomm Snapdragon 845 processor paired with 8 GB of RAM. The battery is large at 4,000 mAh. The 12-megapixel main camera features 4-axis optical stabilization and a secondary 5-megapixel sensor. It's available with either 128 or 256 GB of internal storage. A cheaper NEX model has the same all-screen design, but a standard fingerprint reader on the back, a Qualcomm 710 processor, 6 GB of RAM, and no support for Sprint bands. If Sprint was smart, which is doubtful, they would allow this phone on their system, and even offer it for sale, even if it was online only. But one never know's they do sell the Essential, and using it on their $15.00 month special which they offered last month. After taxes and fee's comes to just over $19.00. It isn't as bad as people claim, but it's nowhere as good as the other three major carriers. A few weeks ago was in Philadelphia and got 71.4 down and 6.16 surprised me. It's usually around 1/10th that speed.